Let your child bounce and sway in our Jumperoo which provides a safe place to play. Seat rotates a full 360 degrees and allows your baby to play with all the toys. 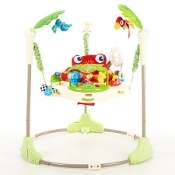 The Jumperoo stimulates visual and auditory senses. For babies up to 25lbs. Styles and colors may vary.